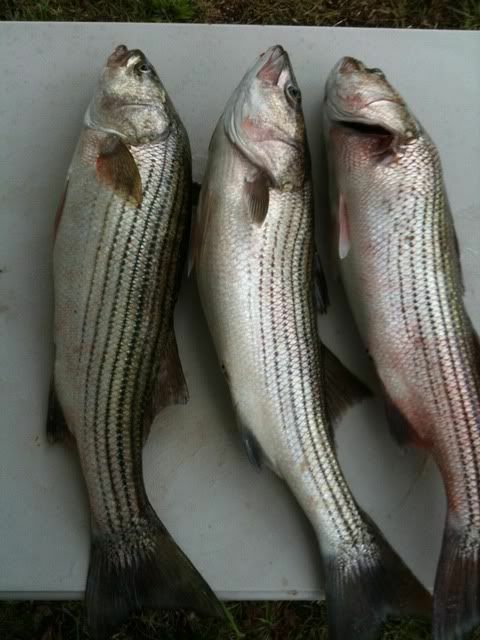 STRIPER SOUP :: View topic - SEEING RED! Posted: Wed Sep 22, 2010 9:40 am Post subject: SEEING RED! Ok, here is one of those questions that may have not have an exact answer. This subject is starting to cause a problem in our club during tournament weigh in time. More than a few times this year some of our contestants are weighing in fish that for some reason are turning red. I am not talking about a few red marks on them or a few scales missing type red marks that are present when we boat the fish. Sometimes when we catch fish above treetops- they look to have been aggressively feeding in the trees resulting in red bruises. Sometimes the fish while in a cooler get bruised up from blocks of ice. I am not talking about the above, the fish that are being weighed in that are in question look like they have been spray painted with red paint on one or both sides! Our club goes by the old adage that clear eyes and red gills mean that fish is caught within the past 48 hours or so. I personally don't buy it as a 100% indicator of a fresh catch. A fish found floating in the lake can have red gills and clear eyes or one even found on the bank for that matter. Our tournaments last from 10pm on Friday to weigh in at 10am on Sunday with just one weigh in, two fish per team. We realize that a two day weigh in may eliminate this but the lake is so big that many guys that fish out of pontoon boats have a rough time traveling the 17+ miles from where the fish sometimes are to the only ramp that has a pavilion and minimal pleasure boater activity, which is where we weigh in. This year we had a team caught cheating in a club tournament by the Pa fish commission. Among other things they were caught fishing in restricted waters in front of our large hydroelectric dam. This incident started to get us thinking about others who may not be fishing fairly during tournaments. In the past 7 years that I have fished two day tournaments I have never had a fish get red when simply placed in a cooler with ice. These fish look like someone dipped them in a vat of strawberry syrup. So what do you guys think about the following questions? 1. 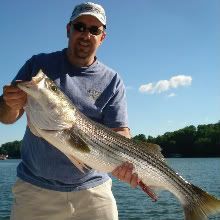 Would the striped bass clubs where you fish allow such a fish to be weighed in? 2. Did you ever have a fish turn red when it was on ice? 3. What do you consider as a good indicator of when the fish was caught? I don't know the answers to your questions but there may be a simple solution. Issue a code number that is not available until the tournament starts and require pictures of the fish while it is still alive on a measuring board with that code number in the picture. Index card with the number works well. Fish weighed in must measure the same length as in the picture to be weighed in. Cheating would still be possible if a striper tube or the like was used but it would stop most of them. Similar solutions used in Georgia but the fish are actually released and only the camera is brought in. I would not fish a tournament if suspected cheaters are involved. It sounds very suspicious. If I were the judge it would be tossed out, and try to set up a system maybe like diehard suggested. Are the fish weighed in the running for prizes? I also would not fish in a tourny where cheating is suspected after the first time. In the pic below, these were fish that we caught in the peak of summer and did not want to return due to the water temps - caught between 6 & 0 am or so, they were put in a cooler with ice, and this pic was taken about 6pm that same day - the one on the right showed a fair bit of "redness", and if I recall the the gills were no longer bright red, but rather more a dull maroon. On Lanier, the Fun Fest did not weigh a fish. The standings were determined by length. A measuring board was furnished each team along with a card with team number and a space to write the fish length. The fish was lain on the measuring board, the length was written on the card and a picture was taken with a furnished pre-programed cell phone showing nose and tail of the fish on the board. The picture was e-mailed to the Tx headquarters and recorded. The picture verified the written length on the card. Fish were then released. Our striper club (and MANY others) use the virtual weigh-in technique. The morning of the TX, two people pick a number from 0-9...the two numbers give the "photo beacon" of 10-99. You can do this any way you like, and have as many digits or letters in the beacon. When the TX is over, we all head to the "weigh-in." which is only where the digital photos are reviewed. It is a two fish, total length score which determines the winner. It works VERY well. You WILL have a bunch of guys curse at the idea of a "virtual weigh-in." They are just set in their way of thinking, that's all. They will also, GET OVER IT when the time comes. Diehard, Ecox and others the number code will solve 99% of it and I have already suggested it to the board. It is so simple and easy to do that I cant think of any reason anybody would be against it other than they have something to hide. I will update this thread in the future when the weigh in code is initiated.- Thanks guys this will solve everything! The weigh-ins are for cash which makes people greedy. Which I don't think is the reason for our cheating team. I think they wanted to be the best at any cost. We found out that one of them was arrested on a drug charge as well so that speaks to what type of moral character they have. They are about to be banned from the local two clubs as well as any tournament fishing on our lake for life. This is the best punishment along with his fines, boat, gear and truck being seized. This will really hurt him since he is trophy hungry for his trophy room.